Andrew Lloyd Webber has officially renamed the New London Theatre in honour of Gillian Lynne, who choreographed Cats there in 1981. The renaming means that Lynne, 92, has become the first woman to have a West End theatre named after her. The Gillian Lynne, now showing School of Rock, was home to Cats from 1981 to 2002. 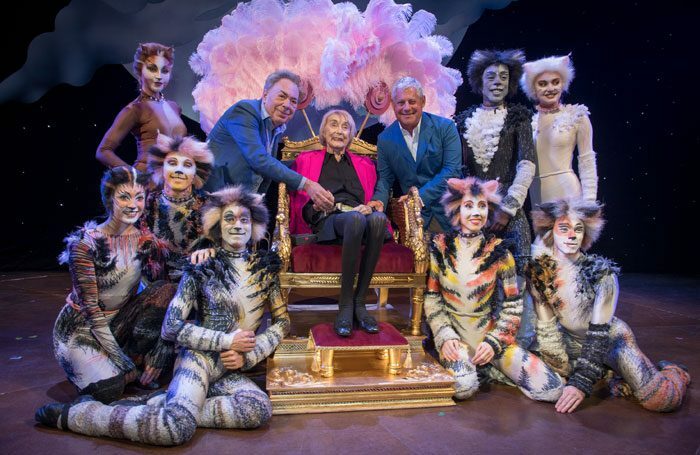 It was officially relaunched as the Gillian Lynne Theatre at a reception hosted by Lloyd Webber, at which he presented Lynne with the keys to the building – which had been engraved with a cat. Mackintosh, who produced the original production of Cats, described Lloyd Webber’s idea to name the theatre after Lynne as “inspiring”. He added that to have her name “emblazoned in lights” on the theatre was a fitting tribute to the careers she had helped throughout her own. Lynne has directed more than 60 productions in the West End and was made a dame in 2014 for her services dance.